I wish I were multilingual. I took French in high school, but I didn’t care all that much about learning the language. I kick myself sometimes that I didn’t take that class more seriously. 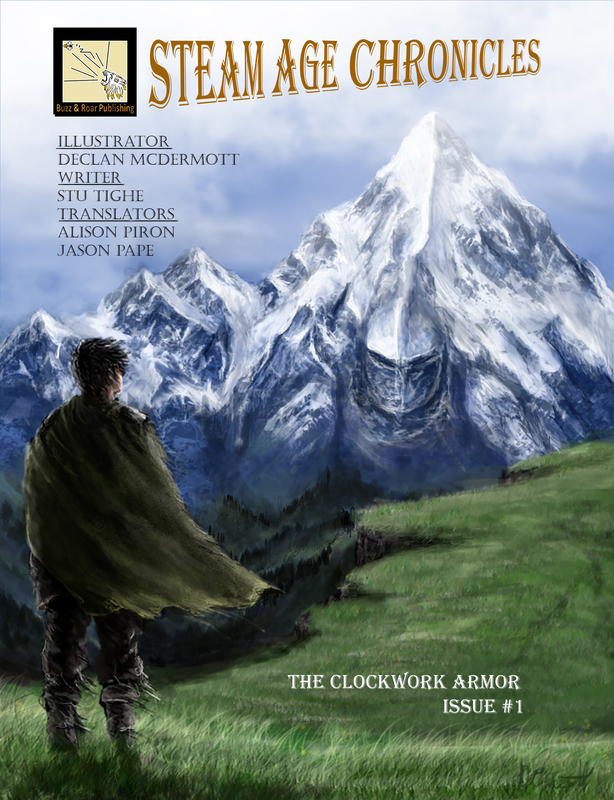 Recently, I was sent a copy of “The Clockwork Armor,” the first issue in the new comic series Steam Age Chronicles from Minnesota’s Buzz & Roar Publishing. (Buzz & Roar was also behind Illusion, which fellow Twin Cities Geek reviewer Kelly Starsmore looked at last year.) As I glanced at the front cover, I noticed that besides listing the illustrator and the writer, it also listed the translators. Huh. It quickly became apparent why translators were necessary when I flipped through the pages—the whole comic is spoken in a variety of languages (including French). How cool is that? Steam Age Chronicles is a culturally driven comic with heavenly artwork and an ingenious story. As the comic begins, we see our combatant, Sebastian, causing a whole lot of trouble. He drinks at the pub and ditches the bill. He’s very flirtatious. He is then confronted by a group of soldiers based on the heritage in his family—his grandfather has ties to the East India Trading Company, which is useful to the protector of England and Scotland. Sebastian becomes roped into an adventure to Japan, and it doesn’t take long for mishaps to occur. In addition to a steampunk theme, this comic also gives off a historical fiction or Pirates of the Caribbean feel to it. There aren’t actually any pirates, at least in the first issue, but I just get that vibe from the look of the soldiers and the women. As I revealed earlier, Steam Age Chronicles is not in English. However, don’t let this scare you away from purchasing the comic. Attached to its front cover is a special translator “monocle” that allows the reader to follow along with the story in English. It was something to get used to, as the English lettering is small, but I adjusted rather quickly, and the translations are so eloquent. The Steam Age Chronicles translator. Heavenly is the perfect word to describe the artwork. It feels like I’m looking at a Claude Monet comic—it feels like a series of watercolor paintings with a story. The front cover is spellbinding, with the knight blending perfectly into the brisk mountain, Sebastian presumably looking ahead at his future journey in early Japan. With his tattered green cloak swaying behind him and his rugged boots, he’s ready to survive on his own. The artwork is nothing like I have ever seen before, and that’s what makes this comic so unique. Author Stu Tighe, illustrator Declan McDermott, and translators Alison Piron and Jason Pape all get a standing ovation from me. This comic is mesmerizing and enchanting, and it flows incredibly well. You can buy “The Clockwork Armor” from Buzz & Roar Publishing’s online store, on Amazon, or at the Source Comics and Games—as well as from the publisher’s table at MCBA Fall ComiCon (October 8) or the Twin Cities Book Festival (October 15). I may even buy another issue myself because I wish I had paid money for it rather than getting a free review copy; it was that amazing of a comic! Follow Buzz & Roar on Facebook to keep updated on the release for issue #2, which is currently expected to be out in late 2017 or early 2018.